Oh Alison, what have you started!?! Encouraging us to share the ugly bits of our garden...people are going to discover this gardening thing is hard work, that gardens aren't always "tour ready"...that nature is, well, messy! Now there's tall bamboo that flops when heavy rains and wind hit, as they've done over the last few weeks. Draw an imaginary line straight up from the edge of the patio, see how far the bamboo is hanging over that line? I've got some major cutting back to do. The Mahonia eurybracteata 'Soft Caress' and M. eurybracteata 'Indianola Silver' are both looking nice, even though they're under an overhanging bamboo canopy. On the right, in the photo above, is the Tetrapanax which almost pulled out of the ground a couple of years ago, forced down by the weight of ice built-up on it. I braced the trunk with a piece of Arctostaphylos wood and never have gotten around to taking it out. Some people have expressed surprise there's so much space back here, what can I say? We placed the tanks in early 2006, I really had no idea how precious every inch of space would eventually become. Back then we hadn't built the patio yet and just arbitrarily chose placement that seemed appropriate. And caused the Sasa palmata f. nebulosa to lean at an unfortunate angle. Although fact it only gets sun from the east and directly above —never from the west—certainly doesn't help. (I'm looking up at the neighbor's laurel, they did a wonderful job of pruning it last year, we just need to keep up with it). ...and a third Aucuba and second Mahonia. The cement wall section seen above is the end of the wall at the south side of the patio, the one which runs in front of the shade pavilion. I have to say taking photos for this post has been a great reminder to get out and trim that low-hanging laurel now, when my yard waste bin isn't overflowing, after all that poor variegated Fatsia (that's the long bent trunk emerging from the stock tank, above) deserves to stand upright! This is the first year the Mahonia x media 'Marvel' has bloomed. 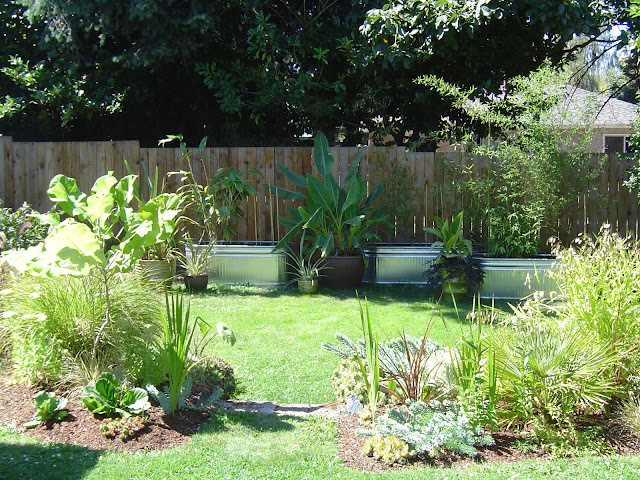 Between the first and second stock tanks, just behind the Tetrapanax you saw at the beginning of this post, is an old metal IKEA planter with a Daphniphyllum macropodum in it. How did such a cool plant get shoved in such a lame place? It's a long story. I keep meaning to actually get out here and dig a hole in the ground for it (that way I could trim even more bamboo and still have green), but haven't done so yet. Although there are a few rocks. I keep forgetting I used to pile them back here. I should start digging them out and use them. And north, towards the NW corner of our property. Aucuba himalaica var. dolichophylla, this plant is a trooper! It's in deep shade and gets no summer water, none! Still it lives on. And peeking around the edge of the second, back towards the first. There's a whole lot of Aspidistra elatior in there, along with a couple of small Tetrapanax and the large one's trunk (and another Mahonia eurybracteata 'Soft Caress'). Let's venture all the way to the fence shall we? It's really ugly back here since I haven't done a thing to clean up after the leaves fell this autumn. Dried Paulownia tomentosa leaves in the Fatsia polycarpa ‘Needhams Lace’ and bamboo. And there are more Paulownia leaves and a nice layer of Doug Fir needles over the gravel mulch. At least when it's thick and a little wet I can lift up chunks of leaves and needles, revealing the gravel below. A little raking of the gravel (mostly with my gloved fingers) and the remaining needles will sift lower through the gravel, now I just need to get back here and do it! Are you interested in some trunk ID on that photo above? ↑ Working left to right across the photo, and starting in the corner: Eriobotrya japonica (Loquat), Azara microphylla, Sambucus nigra 'Black Lace' (the bent stem), Paulownia tomentosa, Daphniphyllum macropodum, Pittosporum illicioides 'Strappy' (the pair of super skinny sticks) and at the far right, and crossing back over the Pittosporum, is the Fatsia polycarpa. That my friends is cramscaping! Here's the corner and the Eriobotrya japonica and a random bit of Sambucus. I pollard the Sambucus every spring when it first starts to leaf out. More Eriobotrya japonica and Sambucus. A random Doug Fir branch at the base of the Paulownia. Notice how clean my neighbor's gravel is, on the other side of the fence. They have a mow and blow crew come through every week. We've caught them blowing stuff through the fence to our side. Nice eh? The Paulownia was freshly coppiced back then, just beginning it's growth spurt. The non-variegated Daphniphyllum and Sambucus are both looking lovely. And the Fatsia was showing off it's dramatic new foliage. And on to the patio. #tellthetruthtuesday is a garden bloggers meme that Alison (Bonney Lassie) created to help keep it real, to show the reality that our gardens aren't always perfect. I think I've delivered! Love the before shot and the summer shot which give the "mess" more context. Is the bamboo contained in those tubs or can it break through? I can't imagine any gardener who doesn't have problem spots. The only way everything is perfect is if you have staff. I think that variegated "grass" is a Carex. A lovely post, nothing appear too messy or ugly... just winter, and non of the Mahonia seem to care: they are looking very happy and helthy. That last photo doesn't even look like your garden! Nothing agitates me more then noise pollution of "mow and blow". Or just blow. Oh gosh...I so agree! The noise those guys make with their lawn care equipment is insane! Your garden has come a loooong way since that early shot. It's almost cleanup time here in Austin too. Cleanup time here is whenever it's not raining! Ooh look at all that space behind the stock tank. It's not messy, just has a nice application of organic leaf mold mulch. What does the cutting back of the bamboo in the tanks entail? Do you thin out the culms by cutting old ones down at the base? That large mass hanging over the patio does look oppressive. I'm amazed there are plants thriving back there. Gosh, I have a lot of messes like this everywhere. The size of Clifford in 2006 is amazing, I can't wait till mine puts on some height, it's a few years old now but never seems to get any bigger. Yes, cutting the culms at their base, it generates quite the mess of stuff to get into the yard waste bin. Just last night I was looking at Christopher Lloyd's last book, Succession Planting (2005), which has an inspiring picture of a scrim of bamboo right by a path. Every winter a Great Sister gardener cuts out every old culm, leaving only the freshest green ones. The effect for the rest of winter is gorgeous. This post is a perfect set-up for an "after" shot when you've clipped and propped up things in and around the tanks. Hope the weather gives you plenty of chances! Our next shot at outdoor work is a few hours on Sunday and Monday -- but between now and then comes *another* inch of rain, so it may be too squelchy to do much. There should be a special horticultural auto-correct that we gardeners can download, don't you think? I've begun some of the cutback already, it's a good feeling. Oh to have a staff! All that unused space ... this post is an invitation for shopping. Even in my milder climate, winter does tend to reveal a garden's warts, doesn't it? Bamboo, even contained bamboo, scares me, although I can appreciate its value as a screen having grown up with a wall of it outside my bedroom window (affording privacy from a pervy teenage boy next door). I look at those tanks of bamboo now and wish we'd found another solution, but since they're there I'm trying to take care of them the best I can.